If your home’s roof is more than 15 years old, it’s the proper time to have it inspected. Age, weather, and relentless sun exposure all take a steady toll on a roof, so you don’t want to take any chances when it comes to protecting your biggest investment. Building an addition can be a great alternative to selling and buying elsewhere, especially if you’re satisfied with your current community. Our design team can help you to create a space to fit your unique needs and lifestyle. Replacement vinyl siding can transform your home and give it a fantastic new look. Vinyl siding is also a hassle free solution since it is virtually maintenance free and weather resistant. A gutter system is a vital component in keeping your home in great condition. Gutters funnel water off of the roof and away from your home, which protects your siding, windows, doors and foundation from water damage. You can instantly improve the appearance of your home while also increasing its comfort level by choosing quality replacement windows. Our experts can help you find the style and type of window that will work best for your home. Replacing your doors can increase your home’s security and decrease your energy bills. Our experts will help you navigate the amazing amount of options and features to find the perfect door for your home. Our experienced team can help you make your deck, sunroom or porch project a reality. 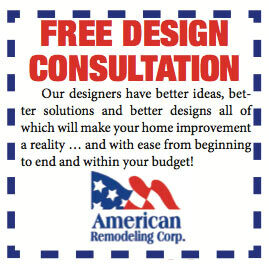 Regardless of how much planning you’ve done, American Remodeling Corp. has the talent and craftsmen to handle your vision from start to finish.